Before the mid-1960s, the neighborhoods we now call the Lower East Side and the East Village were essentially the same thing. During the 1960s, many artists in the northern section of the Lower East Side started calling the area “East Village” to recognize the rise of a new culture in the neighborhood. The label was used to make a distinction between the older bohemian Greenwich Village to the west as well as to the Lower East Side on the south. The Beckenstein Building at 130 Orchard Street encapsulates the area’s continued story. The Lower East Side and the East Village have long been associated with a diversity of immigrants from many nations settling the area in sequential waves. Beginning in the late 19th century and continuing into the early 20th century, the Lower East Side was a central location for Jewish migration to New York. Living in crowded tenement buildings, with very few green spaces for relief, the residents built businesses, synagogues, and created some of the most vibrant street markets in New York. Orchard Street is one of the great streets of the Lower East Side. A walk on the street from its intersection with Grand Street north to E. Houston gives a glimpse of its immigrant past, provided you imagine a ten-fold increase in the number of people on the street and in the apartments. 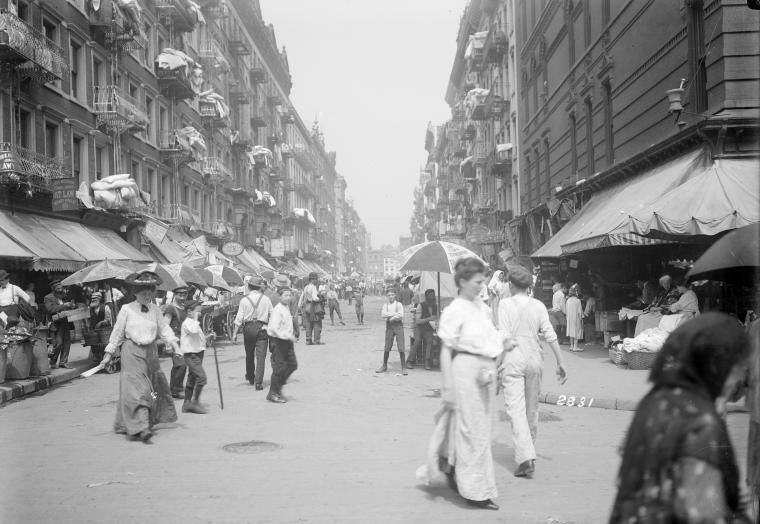 Check out the photograph (above) of Orchard Street near the intersection with Rivington Street, circa 1902 - 1904. The tours offered by the Tenement Museum bring the historical Orchard Street experience alive. In immersive role-playing experiences within the living quarters, visitors are asked to suspend their attachment to present-day things and imagine everyday life in the tenements. The museum also offers walking tours. Be sure to visit the museum's great gift shop for all things related to the immigrant experience in New York. Orchard Street. The building on the left is the Blue Moon Hotel, one of several hotels on the Lower East Side. The trees are a modern addition to the streetscape. The modern Lower East Side has taken on a different cast these days, attracting art galleries, farm-to-table type restaurants, and many bars. Hotels on Orchard Street such as the Blue Moon Hotel and Orchard Street Hotel offer amenities that would astonish residents a hundred years ago, such as being able to sleep indoors in the summer under a pile of luxurious sheets. More hotels are scheduled to open soon on Orchard Street and on the Bowery. Immigrants from the turn of the twentieth century would recognize some of the same buildings still standing on the Lower East Side and many of the deli items found at nearby Katz’s Delicatessen on Ludlow St. or Russ & Daughters. The latter has a cafe on Orchard Street, a shop on E. Houston, and an outpost in the Jewish Museum. Still, a construction boom is shaking up the area once again, and a walk south on Orchard Street past Grand Street introduces dozens of storefronts in flux. The Beckenstein Building at 130 Orchard Street (see image at the top of the post) encapsulates the area’s continued story. The 1902 building was once home to the Beckenstein fabric business. In 2017 Paris-based Galerie Perrotin moved its commercial art galleries from Madison Avenue to 25,000 square feet at this location. The movement of art galleries to the area may be a significant wave, akin to the early art days of Soho. 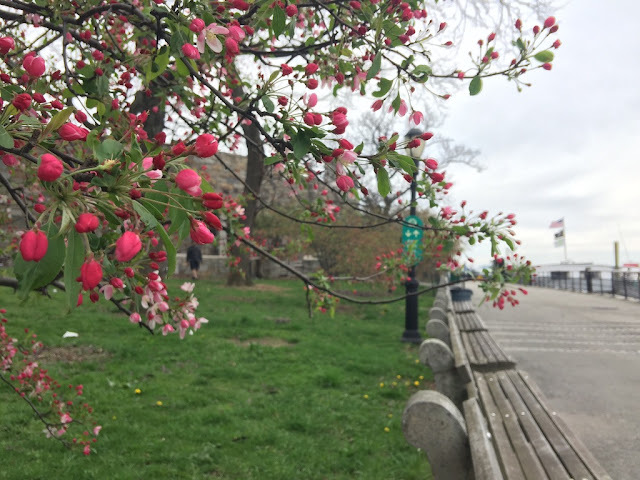 The walk now skips ahead to Tompkins Square Park in the East Village where the recent rains have transformed the park into a near tropical oasis. The area near Tompkins Street Park is known as Alphabet City for the A, B, C, and D Avenues located here. The neighborhood was settled by immigrants from Germany and Eastern Europe, and in the middle of the 20th century by Puerto Ricans or, more accurately Nuyoricans. The area became known to Nuyoricans as “Loisaida” and signified a growing place of community activism. The former P.S. 64 at 605 East 9th Street was repurposed as a vibrant community center called CHARAS/El Bohio Community Center. Members of the community have been fighting to regain and re-establish the center here. La Plaza Cultural de Armando Perez Community Garden, founded in 1976, is also a living legacy of the activism of Loisaida. Members of the community removed trash, planted gardens, and staged cultural events to improve the neighborhood. After fighting off developers in the 1980s, the garden community continues to thrive. An outdoor table at Esperanto, a Brazilian-inspired restaurant at the corner of Avenue C and E. 9th Street, may be a good place to stop and rest from the walk or to recharge for future calls to action. Contemporary images by Walking Off the Big Apple from August 9, 2018. 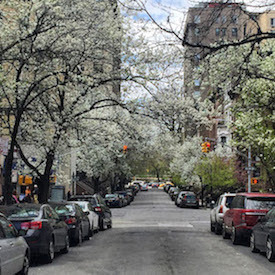 Note: In May 2008, I visited Orchard Street and other streets in the Lower East Side for a series of walks on this website. The photos are archived in this Flickr album.